First of all, commercial metal roofs are impressive, long lasting, durable, and require little maintenance. We offer a wide range of styles and colors. Made up of interlocking panels that run vertically, metal roofing allows water to run off with out seeping into the seams. BM Roofing Contractors specializes in commercial metal roofing for all sizes and styles of structures. Metal roofs are impressive, long lasting, durable, and require little maintenance. 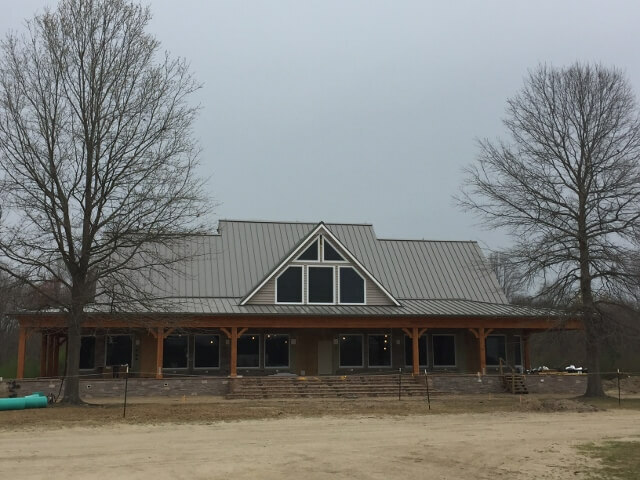 A standing seam metal roof system is one of the most durable and weather-tight roof systems available in the industry. Standing seam metal roofing panels are a concealed fastener system, they are lightweight, last up to 50+ years and are a great choice for commercial, residential, and industrial building applications. Not only are they aesthetically pleasing but also structurally sound. A variety of weather-tight warranties are available for these types of systems. Warranties can boost your building’s market resale value. In addition, metal roofs withstand higher wind uplifts than traditional shingles. Positive Environmental Impact: Metal roofing is a recycled material, saves waste from entering landfills, lowers energy consumption, and helps reduce greenhouse gas emissions. In today’s world energy efficiency is important. Metal roofs have the option of a special coating designed to reflect away UVA rays, and studies have shown that this can provide an energy savings of up to 25% on cooling expenses. Metal roofs offer design flexibility and come in many styles and colors. If you would like more information on metal roofing, please stop by our office to allow our sales staff to educate you on the system that would work best for you. Looking for a First-Class Commercial Metal Roofing Company?